No not the cheese, the delicious French dessert! 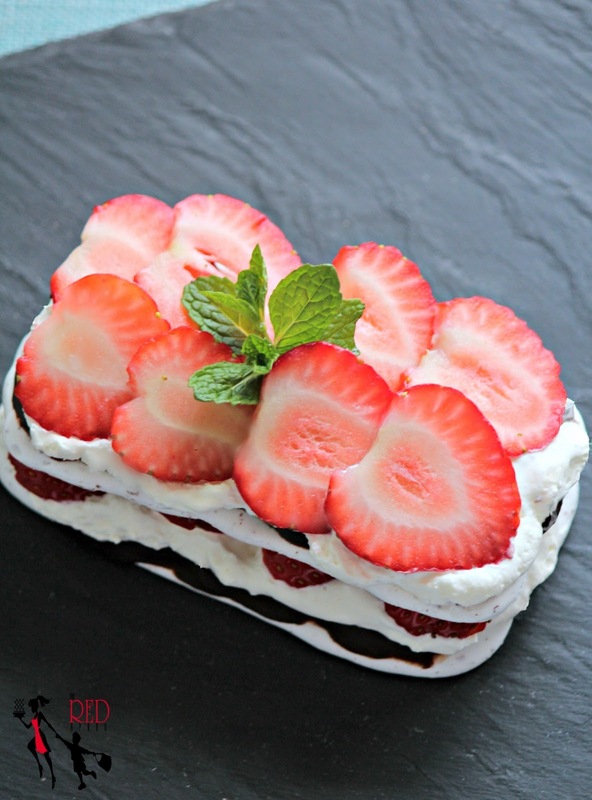 Vacherin is composed of layers of meringue, chocolate, assortment of berries, and cream. Sometimes made with vanilla ice cream and nuts. This two to three-tiered delicious dessert makes a show stopping centerpiece. This is something I whip up on last minutes dinner invites. I just arrange everything on the table and let everyone assemble their own Vacherin. It's a fun dessert activity for everyone. Preheat oven for 275° F.
Draw 3 rectangles, each measuring 4x10 inches or 2x4 inches for individual size, on sheets of parchment paper, and place on baking sheets. Whip egg whites with an electric mixer on medium speed until frothy. Use the wire whisk attachment if using a freestanding mixer. Add 1/2 of the sugar, a tablespoon at a time continue whipping until the mixture is very stiff and glossy. With a metal spoon, carefully fold in remaining sugar, the cornstarch, and grated chocolate. Spoon the meringue mixture into a pastry bag fitted with a 1/2 inch plain tip, and pipe lines across the rectangles. Bake in the preheated oven for 1 1/2 hours, turning the baking sheets halfway through. Turn off oven and let meringue cool completely in the oven. Peel away parchment paper. Place the broken chocolate pieces in a heatproof bowl set over a pan of gently simmering water. In a separate bowl, whip heavy cream. 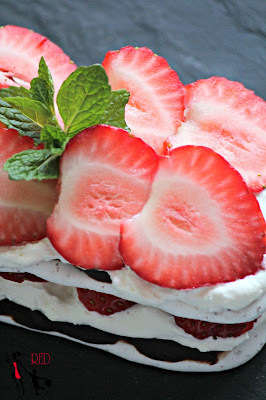 Spread most of the melted over 2 meringue layers, reserving a little bit for garnish. Let set. Place 1 chocolate-coated meringue on a plate and top with whipped cream and berries. 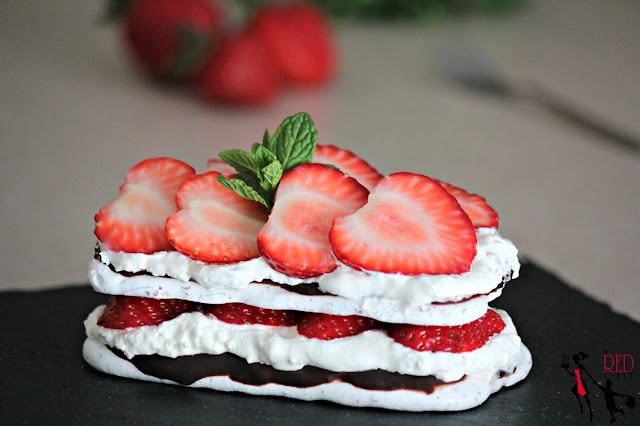 Gently place the second chocolate-coated meringue on top and spread with whipped cream, top with more berries. 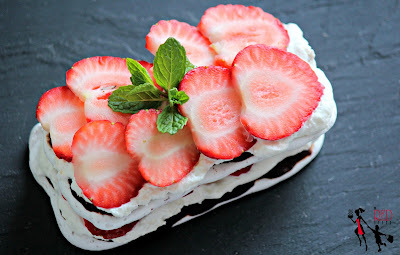 Place the last meringue on the top, decorate with remaining whipped cream and berries. Drizzle with the remaining melted chocolate over the top (optional) and serve. The third tier is optional. You can only do 2 layers if you please, just like what my guests and I did. Holy delightful!! I think I need a cooking/ photography class from you friend! But I think you don't need any help at all. You are rockin' your blog my dear. What a gorgeous gorgeous dessert! Next party, this would be on my table.